SoundFont-compatible patches puts the power and beauty of an entire generation directly into your computer. Sound Burst created Polysix Anthology using over 1,000 extraordinarily-crafted samples - more than 150 MB of data - taken directly from the Korg Polysix, in order to guarantee faithful reproduction of the sound which came to represent an era. 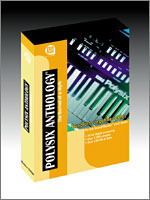 Now, it's easier than ever before to recapture that characteristic sound with Polysix Anthology; another collection of the high quality SoundFont-compatible patches you can expect from Sound Burst. Polysix Anthology has been successfully tested with Creative Labs' Sound Blaster Awe series, Live! series, Audigy series, SpeedSoft Virtual Sampler, BitHeadz Unity series, SeerSystems Reality and SurReal, Steinberg Halion, Live Synth, CreamWare PowerSampler, Sound Burst Sample Farm series and the Tascam GigaSampler series. Listen to this MP3 file created exclusively with patches from Polysix Anthology. We used Steinberg Cubasis as the sequencer, but you can use the sequencer of your choice… it's the Sound Burst patches that make the difference! Download these free SoundFont-compatible patches. You'll be pleased with what you hear.